Is there life left in the Air range? The iPad Air 2 launched all the way back in October 2014, which is enough to make us wonder whether there’s going to be an iPad Air 3 at all, especially now Apple seems more focused on its newer iPad Pro range. But there's still room for an Air 3 in the tablet arena. The Pro range in both name and price is clearly aimed at the upper end of the market, while Apple could position the iPad Air 3 as a more affordable option. And there is also some evidence that that’s exactly what Apple has planned, with talk in some circles of a new, but not quite cutting-edge, 9.7-inch iPad on the way. We’ve collected all the news and rumors about the slate that’s likely to be the iPad Air 3, so if you’re looking for an upgrade to your aging iPad you’ve come to the right place. The iPad Air 3, if it launches at all, will probably land alongside the iPad Pro 2, which means we could see it in the next few months. With the iPad Pro 9.7 launching in March 2016 a refresh is likely around March of this year, though we might have slightly longer to wait. Chip problems are reportedly causing delays to the iPad Pro 2, and respected analyst Ming-Chi Kuo reckons the next wave of iPads will arrive sometime between April and June. Failing that, we might see the iPad Air 3 in September or October, as the iPad Air 2 was launched in October 2014 and the tail end of the year used to be when Apple traditionally unveiled its tablets. 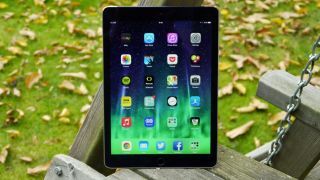 TechRadar’s take: Most rumors point to new iPads in the first half of the year, and if there’s going to be an iPad Air 3 at all in 2017 that’s when we’d expect to see it. There’s a good chance the iPad Air 3 will look a lot like the iPad Air 2 (which itself looks a lot like the iPad Pro 9.7). We’re not expecting big changes to the design for any of Apple’s 2017 tablets, but with the Air 3 likely positioned as a relatively budget option, any refinements could be limited to the pricier iPad Pro 2 models. As such our best guess is a metal build, with quite possibly the same weight and dimensions as the iPad Air 2. That would put it at 240 x 169.5 x 6.1mm and 437g, which Apple stuck with for the iPad Pro 9.7 as well. If anything, the Air 3 might get even slimmer and lighter, to help justify its name, but so far there’s little evidence of that. We've also seen a possible image of the slate, leaked to Apple Insider by a source working on the Chinese supply line. It’s not clear which if any of Apple’s upcoming iPads this is, since from what little we can see it looks identical to current models, further suggesting that not much will be changing visually, but it has a new model number. Other possible changes include the removal of the headphone port or the addition of water- and dust-resistance, as we’ve seen on the iPhone 7. Apple’s Air range has always had 9.7-inch displays, and we have no reason to think that will change for the iPad Air 3 – though of course other sizes do exist in the iPad Mini and Pro ranges. There have also been some rumors of a new 9.7-inch iPad, which is likely to be the iPad Air 3. We also fully expect the resolution to remain the same, at 1536 x 2048, as Apple has stuck with that resolution on its 9.7-inch tablets since the iPad 3. There may be some improvements to the screen, such as True Tone, which adjusts the color temperature of the screen to suit the lighting and debuted on the iPad Pro 9.7, or 3D Touch, which makes the display pressure-sensitive and is found on recent iPhones. Then again these features may remain exclusive to higher-end Apple devices, in order to help differentiate them. There have been rumors that an upcoming iPad will get rid of the home button and instead build the fingerprint scanner into the screen, but as that sounds like a huge change we’re not convinced it will happen, and if it does it’s very likely to be reserved for the iPad Pro 2. TechRadar’s take: A 9.7-inch 1536 x 2048 screen is likely. There will probably be some small improvements over the iPad Air 2’s display, but any big changes may be saved for the iPad Pro 2. There aren’t yet any camera rumors, so all we can do is look at what’s gone before. The iPad Air 2 has an 8MP rear camera and a 1.2MP front-facing one, so one possibility is that the iPad Air 3 will stick with that combination. But Apple is likely to want to upgrade it, especially as so much time has passed since the last model, so perhaps we’ll see a 12MP rear snapper and a 5MP front-facing one in line with the iPad Pro 9.7. Of course, the company may also want to mark the iPad Air 3 out as lower end than the iPad Pro 2, so features that we haven’t yet seen on any iPad, like perhaps a dual-lens snapper, will likely be reserved for the next Pro model. With the form factor probably not changing much the battery size may well not either, meaning we could get an iPad Air 2-matching 7340mAh juice pack. Though with other components now potentially smaller than at the launch of the previous Air there’s a chance Apple will be able to squeeze a slightly larger battery in. According to analyst Ming-Chi Kuo the iPad Air 3 will use a modified version of the A9 chip from the iPhone 6S, which would make for an upgrade on the A8X-powered iPad Air 2, but would likely be weaker than the A9X chip in the iPad Pro 9.7, let alone whatever the iPad Pro 2 launches with. For now we can only guess at other specs, but with both the iPad Air 2 and iPad Pro 9.7 using 2GB of RAM it seems likely that the iPad Air 3 will be limited to that as well – with any boosts reserved for the iPad Pro 2. On the software side, it’s bound to run whatever the latest version of iOS is at the time, which should be iOS 10 if it launches in the first half of 2016. TechRadar’s take: A modified A9 chipset is believable, since the iPad Air 3 looks set to be positioned as a more affordable option than the Pro range. We’re not expecting many new features from the iPad Air 3. Pro features like extra speakers and the Smart Connector are likely to remain exclusive to the Pro range – which means you can probably also count out any sort of official keyboard or stylus accessory. But existing features such as the fingerprint scanner are likely to return, and there’s a good chance Apple will re-work the home button to make it pressure sensitive in line with the iPhone 7. The iPad Air 3 is sure to undercut the Pro range, and there are rumors to back that up. So it will likely sell for either what the iPad Air 2 currently retails for – specifically $399/£379/AU$569, or for what the Air 2 originally launched at ($499/£399/AU$699). In either case that would likely be for a 32GB Wi-Fi only model. Is a new Sony tablet also on the way?